The Latin name for Tobacco is Nicotiana tabacum. Many are surprised to learn that botanically tobacco it is in the Solanaceae family, which means it is related to the potato and tomato family. The cultivation of the plant was thought to have begun around 6000 BC. It is native to Americans, and it is thought that Cuban natives were smoking cigars when Columbus founded this country. The plant grows about one to two feet in height. It has five flower petals, and they have corolla inside them. The flowers can be white, pink, red or yellow. Tobacco plants actually bear fruit. The fruits have two seeds and the entire piece of fruit measures about two millimeters in length. When it comes to this plant, the leaves are what is important. These blades can grow up to 20 inches long and up to 10 inches wide. It’s an egg-shaped leaf that is found at the base of the plant. They are fuzzy on the underside and important to countries all over the world. Nicotine actually comes from the roots of the plant, though they are thought to come from the leaves. 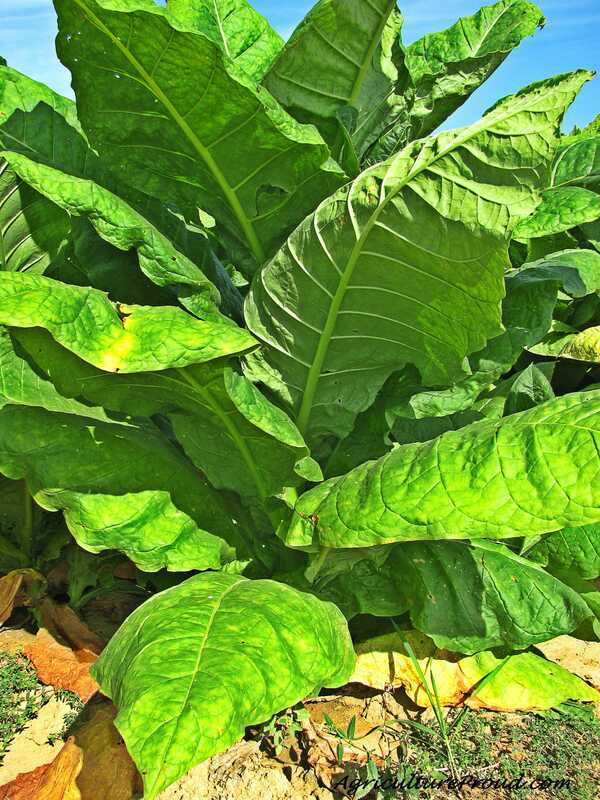 Some tobacco species have higher nicotine content than others. Some can be as potent as 18 percent. Tobacco is a perennial and will come back year after year. Just planting 100 square yards of seeds can produce up to four acers of tobacco. It takes about 6-10 weeks for the seedlings to be transplanted into the fields. The heads must be cut off before the seed head develops, save those plants that will produce again for the next season. They are removed when flowering begins because all of the plants energy will go into increasing the leaves thickness and size. The flowering stalks and branches, which come after the plant has been topped, are removed. This way the plant can only produce large leaves from the main stem. The leaves must be large and lush. To keep these plants healthy, they are fertilized with nitrogen fertilizer. It takes three to five months to have a full crop for harvest. The leaves are removed, and they are left to dry in barns. This is the part where fermentation takes place. There are many types of tobaccos like Air-cured, Burley, Fire-Cured and Dark Air-cured. Since smoking has decreased over the past two decades, farmers have found additional uses for their products. Tobacco can be used in bio-fuels and also in several drug types.